Kazakhstan's Denis Ten is next as we wait for Brezina's score. Ten will start with a quad toeloop as his first element, then perform a triple axel. Brezina sits seventh after the short. Body language suggests he is not surprised and knows he is capable of better than a 81. HOCKEY: Rick Nash is a monster. You can't stop that guy. Have our goals been more individual efforts or passing plays? Figure Skating: 81.95 for Brezina, he sits in 7th. Figure Skating: Denis Ten is up next. He was the surprise silver medallist at the world championships last year. HOCKEY: Patrick Thoresen has been given credit for the only Norwegian goal. It went off him at the side of the net. Peter Liebers is skating now. Four more competitors after this, in what seems like a marathon event. It'll be much more climactic in the free skate tomorrow, as it was in the pairs. You'll recall if you watched that, the two Russian pairs dazzled the crowd and brought them to their feet. We'll see tomorrow who can do that in the men's program. Figure Skating: clean triple lutz! It's a long way to Patrick's free skate. He is in the final flight, with only two skaters behind him. Gold medal rival Yuzuru Hanyu skates just before Chan. Free skating about to start with the very first of 24 skaters. Alexei Bychenko of Israel. Godorozha will receive two scores. One for the free skate, another for the orangeness of his shirt. Neon orange is still a thing. I suppose. Next up is Michael Christian Martinez of the Philippines. He and Patrick Chan were the first two figure skaters to arrive in Sochi so they got to know each other quite well. Martinez even said "I feel like a champion because I'm skating with Patrick Chan... I was trying to copy him but I couldn't." Martinez is the only athlete from the Philippines here in Sochi. 119.54 for Godorozha, which puts him in 1st for the time being. Martinez also told the Canadian Press that Chan "actually told me that I was official Canadian team (member). Love when a besti squat gets worked into a program! Not bad at all for a guy from a country that only has three ice rinks.He spent the last four months training in Los Angeles. Michael Christian Martinez logs a 119.44 now in 1st place after three skaters. He stood up and waved to the crowd with appreciation. I hope that guy is on TV in the Philippines right now. Next on the ice is Zoltan Kelemen, of Romania. Kelemen is the fourth of six skaters in the first flight. There are 24 skaters in total, six per group. Chan will be the fourth skater in the final group. Kelemen is one of what some figure skating fans like to call OES - Obscure European Skaters. Some of them break into the top tier but before they do often the only times they get seen on TV are at major events like the Olympics. In just under 5 min, Canadians Sarah Reid and Mellisa Hollingsworth are going for gold in Women's Skeleton! Keep it here for live updates! I like that the crowd is trying to push him to finish strong after a number of falls. In the meantime, check out Reid's awesome helmet! Zoltan done. I'm pushing him because his name is Zoltan. And I like it. A lot of deductions coming up for Kelemen. Sadly he may be back to obscurity, Paula. Aaaaand this video! 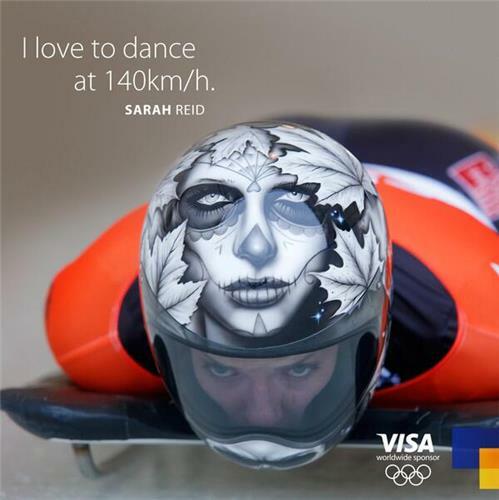 In the sport of skeleton, it's all down to that 5-second push-start. So much pressure!